#!/usr/bin/geek: Whats wrong with this picture? 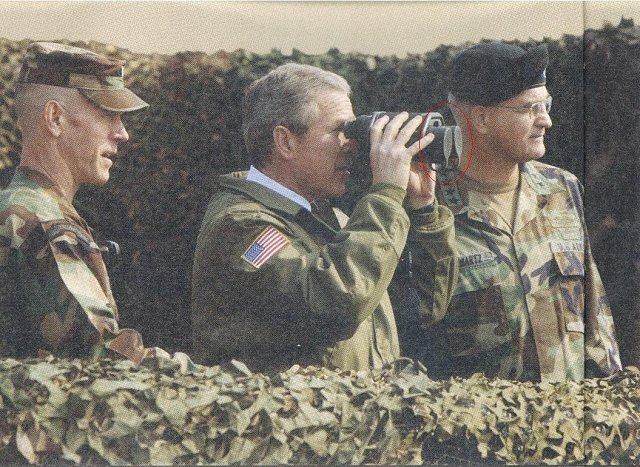 The President is most likely holding a pair of night vision binoculars and if thats the case he is using them properly during daylight. With night vision binoculars each lens cap has a small pin hole in them to allow only the tiniest bit of light through them so they may still be used in daylight. If the lens caps would have been removed, those $10,000 Army issue binoculars would have been ruined because bright light would cause permanent damage to the intensifier tube. Even if they're not night vision binoculars, who among us hasn't ever accidentally raised a capped pair of binoculars to their eyes for a few moments before realizing the problem? The difference is that most of us don't have a crowd of photographers hanging around us all day long just waiting to snap such a picture of the moment. Perhaps the only thing that might be wrong with the picture, is the fact thats it has been passed around almost two years as big joke when there is actually nothing remotely funny about it. It's not a doctored picture. There's not a small hole at the end. There's another picture of Bush Jr. a few seconds later with the lensecaps off. See the URL for it. At that same site, there *is* a doctored picture of Clinton doing the same thing there.